Hawaii's Kilauea volcano could soon send boulders and ash shooting out of its summit crater in the kind of explosive eruption last displayed nearly a century ago. Scientists said Wednesday the risks of an explosive summit eruption will rise in coming weeks as magma drains down the flank of the volcano toward the area lava started erupting from fissures in a residential neighborhood last week. A summit explosion could also release ash, steam and sulfur dioxide gas. Kilauea has destroyed 36 structures — including 26 homes — since it began releasing lava from vents about 25 miles (40 kilometers) east of the summit crater. There are now 15 of the vents spread through the Leilani Estates and neighboring Lanipuna Gardens neighborhoods. Hawaii Gov. David Ige said a geothermal energy plant near the lava outbreak was accelerating its removal of stored flammable gas as a precaution. The Puna Geothermal Venture plant has about 50,000 gallons (189,270 liters) of pentane. Ige, a Democrat, expected it be removed by the end of Thursday. It would be "very, very hazardous" if a volcanic vent opened under the facility where the fuel is stored, the governor said. The plant, which is owned by Ormat Technologies of Reno, Nevada, is across a highway from where lava has been erupting. In coming weeks, the summit crater could eject blocks up to 2 yards (1.8 meters) in diameter a little less than a mile (1.6 kilometers) away, the United States Geological Survey said. It could also send pebbles shooting into the air several miles away, the agency said. 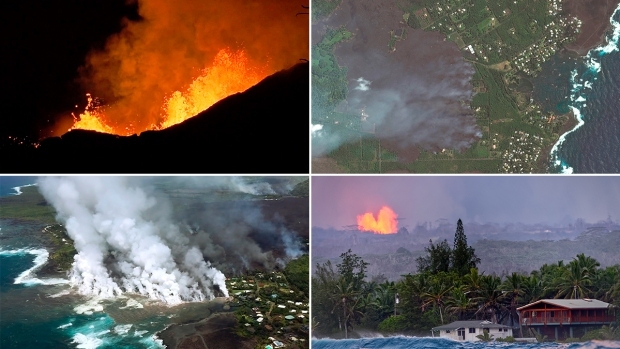 Distant communities such Hilo, about 30 miles (48 kilometers) away, could get a dusting of ash. This event could occur again when the summit lava lake drops so low that groundwater can flow into the conduit that feeds magma to the crater. The magma would heat the water and create steam would push accumulated rocks out in an explosion. No one lives in the immediate area of the summit crater. Hawaii Volcanoes National Park, which includes the crater and surrounding region, announced Wednesday that it will close Friday in anticipation of the possible explosive event. Police said Wednesday they arrested a man suspected of burglarizing homes in Leilani Estates. A resident saw the man leaving his house when he returned to retrieve personal belongings. The resident and a friend took the suspect to police officers, who arrested him.